We had a great hop last week, so welcome back for week #38! Sorry it's so late this week. My laptop was dead and I had left my charger at work. Better late than never though! I hope you will still link up and invite others to join!! 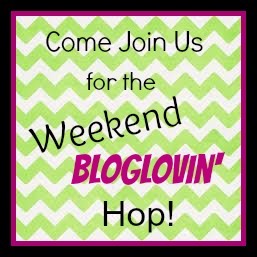 I'm so glad you are here to be a part of this fun weekend hop! Bloglovin' is one of the best ways to stay up to date on your favorite blogs! So let's make it bigger this week by spreading the word on twitter using the tweet button below. Tweet You automatically become my favorite when you tweet the hop:) Ok let's get started! But first, make sure you follow the host and guest host so you can stay up to date on all of the future link ups and posts Host: The Life Of Faith and then go ahead and start linking up! Please make sure you are linking your BLOGLOVIN' account and not just your blog! And don't forget to visit some of the other blogs linked up and make some new friends! !